Towards the end of last year, Microsoft Kenya partnered with Kenya’s copyright watchdog – KECOBO in a bid to discourage the public against using counterfeit software. The software giant has enlisted the help of authorities worldwide to defend its biggest revenue source. 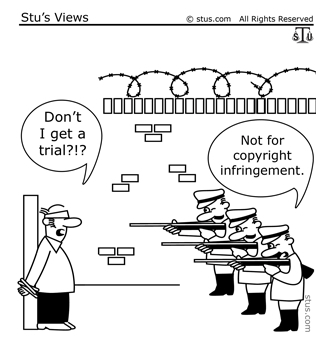 Consequences to those implicated by the hunt for software pirates include jail time and behavior modification programs. In the US, Microsoft has now gotten the support of state Attorneys General as the fight for its intellectual property ensues. If foreign companies don’t comply with Microsoft’s license requirements, Attorneys General will utilize state justice mechanisms to bar them from operating in the US. A more or less similar strategy was devised by Microsoft in 2011. Then Microsoft lobbyed various state governments to pass state laws which would force overseas companies to buy genuine software in order to operate in the US. Failure to do so would place liability on buyers who dealt with these foreign companies. TechDirt disputes the authority of Attorneys General to handle Microsoft’s claim likening this move to a shake down of foreign companies. “In short, states Attorneys General are suing foreign companies, claiming that they’re using infringing software, and claiming that this unfairly “harms” local competitors. Often, the “local” competitors have absolutely no clue this is being done in their name, or that they’ve even been “harmed” by a competitor they’ve never heard of,” states the TechDirt post. An estimated $63.4 billion in revenue is lost to software piracy by Microsoft. The problem hits the company hardest in the Chinese and Russian markets. According to ReadWrite, Microsoft has tried lawsuits, cheaper prices and implementing technologies that make pirating harder with negligible results. Without a mobile portfolio Microsoft is severely hampered. Of course, Microsoft is trying and has made several attempts to place its Windows Phone in the hands of Chinese users. It’s a tough sale however because Microsoft must work through partners. They need to get vendors to license the OS and the operators to range the devices and retailers to push it. Given the flood of “free” Android variants they are having trouble even starting down that long road.